It’s never that simple when there’s a staff change in your team, and especially when the particular change has to do with your manager i.e. your boss. Of course, you shouldn’t ever panic when you get a new boss but you should definitely accept the fact that you have to start from the square one even though you may already be an experienced worker on your position. While skills and experience are always valuable, you definitely don’t want to rub your new boss the wrong way by not doing your best at work. In case you feel a bit unsure about what the best course of action for you is in this case, make the most out of the 3 following practices. Like it or not, when you get a new boss you are a beginner in their eyes. It’s important to remember that. Your new boss may be younger than you or have less experience than you – but, that doesn’t mean that you can do whatever you’d like or treat them with disdain. Actually, the tactic that would benefit you the most is to adopt the mindset of a beginner as well. After all, the new boss will see you that way. It won’t be too long before you get to know each other and get into the comfortable work routine similar to the one you had with your previous boss. But, in order to achieve this kind of a relationship, where it will again be acceptable to be a tad late on occasion or a bit informal in office emails, you need to endure the new “trial” period all over again. If you like your job, it will be worth the effort. Just keep in mind that there’s no point in jumping to the extreme for the first couple of weeks or so if you’re going to get overly comfortable later on. Your new boss will notice just how strange the shift between the extremes is. The ability and readiness to discuss and brainstorm new ideas and possibilities for change and innovation at the office can definitely turn to be highly beneficial for you. Therefore, don’t hesitate to provide your input when it comes to the improvement of your workspace or the overall workflow. However, it’s also important that you don’t go overboard with critique. There’s a difference between being enthusiastic about the change to the better and being so negative that you’re looking for a way to change and criticize every little thing. It’s all about sharing your vision about improving the office productivity and learning more about your new boss’s viewpoint on the matter; and definitely not about belittling the way things were before. Talking things down has never gotten anyone anywhere great long-term. 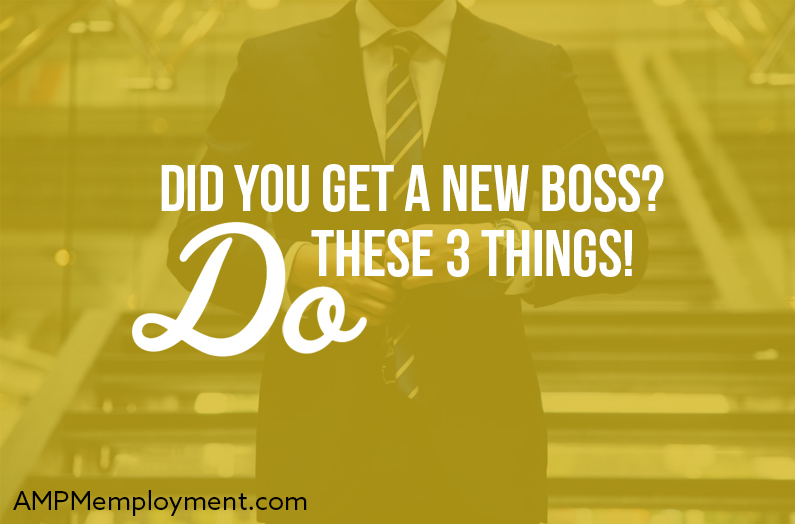 Even though you need to embrace an attitude of a beginner when you get a new boss, you need to remember that your boss is also a newbie in a way. They will probably need help around the office with some appliances or specific aspects of the workflow. With that in mind, don’t hesitate to offer assistance to your boss when you see fit. This is your chance to get on their good side. Of course, that doesn’t mean that you should become a “teacher’s pet”. Talk to your team and let them know how effective you believe their occasional voluntary assistance would be when it comes to your overall relationship with the boss and team efficiency in general. You don’t want your coworkers or your boss to think poorly of you for sucking up. However, provide help, advice, and assistance when needed and welcomed. No one enjoys big changes, especially when they involve work. But, if it so happens that you experience a sudden boss/manager replacement, don’t panic. It’s not the end of the world. And if you play your cards right and follow the above-mentioned practices, you may even make your workplace a better place to work.